Get dizzy while flying around in 360 degrees!? Fun-packed non-stop chaotic 3D shooting! 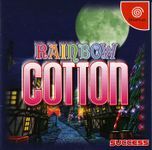 The fantasy shooting game "Cotton" is finally here on the Dreamcast in 3D! Play a chaotic adventure in a fairy tale world that can only be told on the Dreamcast!